Busy year for new and reprint Ditko in 2014. As usual, go here for the occasionally updated list going back to 2005. Robin Snyder and Steve Ditko's publishing continued with two all new books in their 32-page series, some reprint and previously unpublished material in two revivals of old Charlton titles, a 40th anniversary reprint of a Mr. A. book and the final three installments in the FOUR-PAGE SERIES of essays. 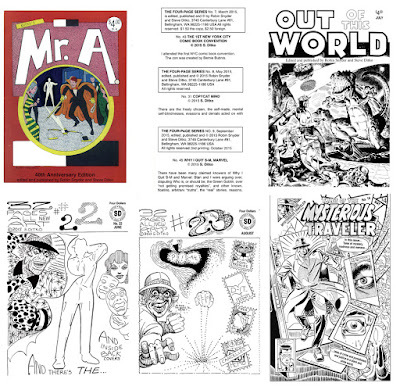 Ditko also contributed to a few issues of Robin Snyder's newsletter THE COMICS, including a wraparound cover on the January 2015 issue. A few things from other publishers, the most noteworthy is STEVE DITKO'S WEIRD COMICS #1, from Mort Todd, reprinting coloured versions of five black and white stories Ditko did under Todd's editorship of MONSTERS ATTACK in 1989/1990. Also some stuff from DC, IDW, Marvel and others.